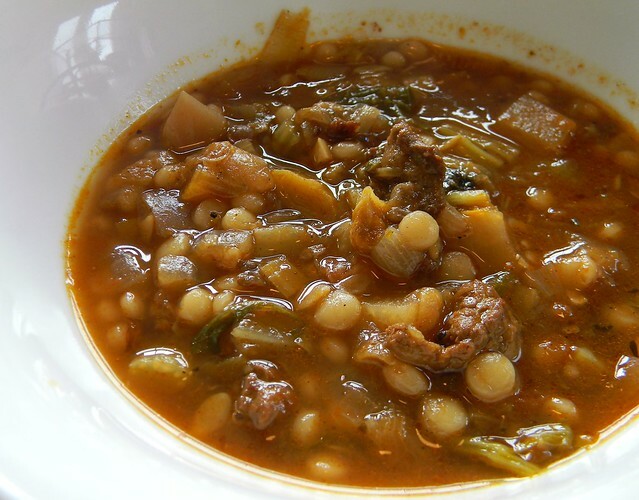 Vegetable Beef Couscous Soup #TheRecipeRedux | What Smells So Good? Heat camelina oil in a large, heavy pot over medium-high heat. Add the beef and brown on all sides, stirring often. Add remaining oil, onion, celery, garlic and Harvest Ragoût. Cook 5 minutes, then add paprika, pepper and tomato paste and cook 10 minutes, until onions are soft. Add wine, stirring to deglaze, then add the broth, water, herbs and tamari. Bring to a boil, then reduce the heat and simmer 15 minutes. Stir in the couscous and cook 25 minutes longer.